How to Insulate an Igloo Dog House? What Size Igloo Dog House for a Lab? Where Can I Buy an Igloo Dog House? What Size Igloo Dog House Do I Need? 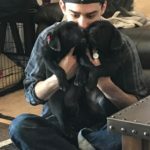 How to Clean an Igloo Dog House? Dog igloos are some of the most unique style of outdoor doghouses. Igloo style dog houses are fun-shaped, well-insulated (usually) and they look well in any backyard. 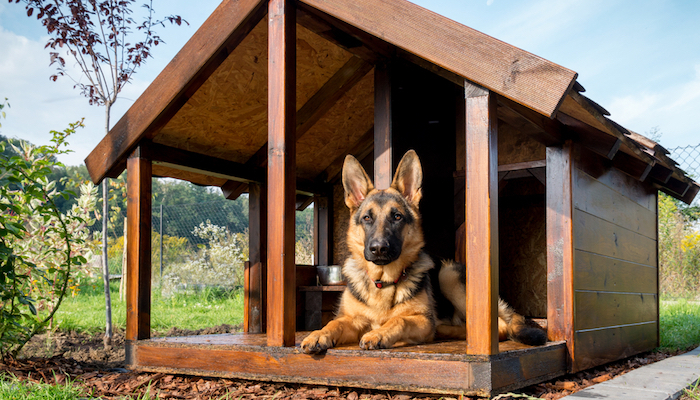 Doghouses are important for several reasons, especially if your dog stays outside mostly. For starters, dog houses keep your dog warm and dry in the rain, against snow and other debris. Don’t let your dog freeze in the harsh elements! Or burn for that matter, since doghouses also protect your dog from the heat of the sun. But how are igloo doghouses different than regular doghouses? They’re much more protective for your dog, and they also give your dog a sense of pride and ownership. A regular doghouse isn’t wide enough, and it usually doesn’t have that “home” feel. Now that you know you want an igloo style dog house, which one should you choose? There’s literally hundreds to thousands of options, so how can you pick the best igloo dog house for your pup? We’re here to take on that task for you. We’ve eliminated all but 5 options to find exactly what you need to give you dog a new igloo house! Does your pup have joint issues? An elevated dog bed might be the perfect option. With one of the most classic dog igloo designs around, this Petmate Indigo dog house is perfect for you pup! It’s shaped with a little room for your dog to hide away, or poke their head out to enjoy the outdoors. 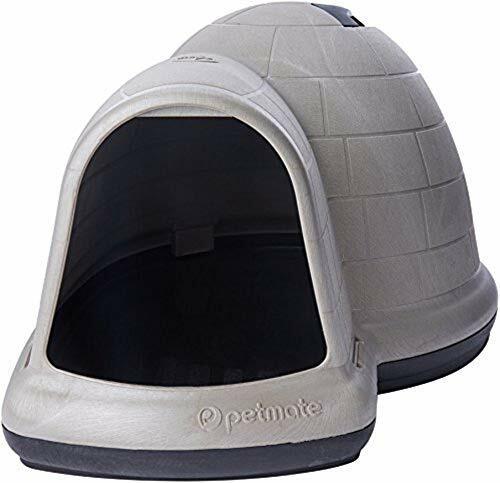 With an aesthetic igloo appearance that makes it look realistic, this Petmate Indigo dog house is one of the best around. 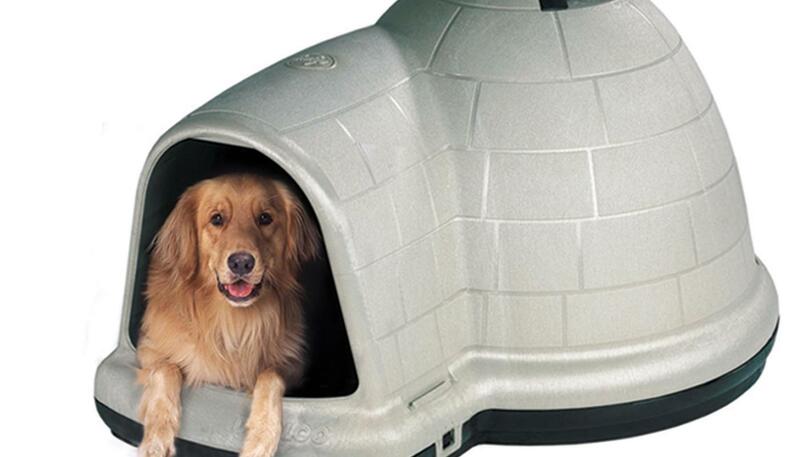 This igloo dog house with Microban is made with the safety and comfort of your dog in mind. The heavy construction of this Petmate Indigo dog house provides excellent insulation from the heat of the sun and the cold of the winter. The offset doorway is also tapered to let the wind and rain blow right over without getting inside the pet igloo. There’s also little roof vents that allow air flow to circulate. Instead of letting stagnant air buildup, your dog will have fresh air all day long. These igloo doghouses come in two different colors. You can choose from either black or taupe/black. We love the taupe/black, because it resembles a real igloo! The choice is up to you, and speaking of choices you can also pick from multiple sizes. There’s medium, large, and extra-large. Many other doghouses aren’t large enough to fit those massive breeds of dogs (Bernese mountain dog, anyone? ), but luckily the extra large sized dog beds will do just fine! Why We Liked It – When looking for the best dog igloos on the market, we couldn’t help but notice all the amazing aspects of Petmate’s Indigo dog house. 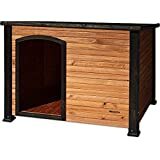 This dog house features everything your dog needs to feel comfortable and protected from the elements. The Petmate Indigo makes for a pleasant experience, you can help your dog relax more by adding some lovely calming treats. While searching through the countless blogs and pet products trying to find the best dog igloos, we came across one of the most adorable inventions of all time. This small igloo dog house is truly the ultimate cozy chamber for any small dog. If you’re looking to keep your canine companion happy as can be, treat them with this fluffy luxury house! You won’t find a bigger color selection in pretty much any other model of igloo doghouses. 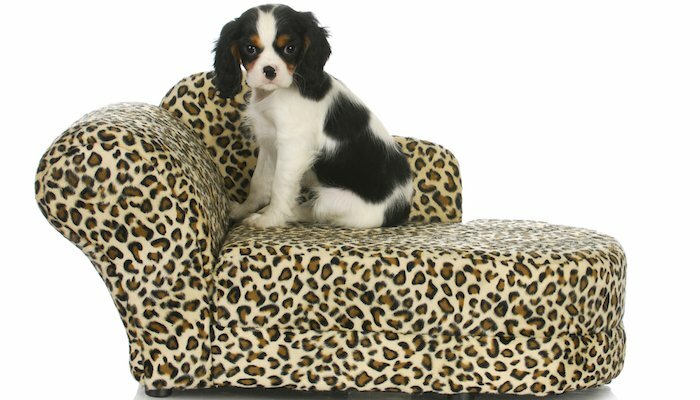 There’s all kinds of different variations that allow you to make your fluffy dog castle into exactly what suits the look of your home. So what colors are there? Well, there’s too many to list but here’s a few: Lux Dark Chocolate, Sherpa Beige, Sherpa Fuchsia, Ilan Tidepool, and more. Clearly there’s no shortage of options! 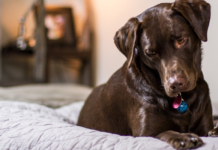 When it comes to living in comfort and luxury, not many things get closer for your dog. These small dog igloos are built with dense, soft foam to keep their little joints and muscle comfortable. It’s also surrounded by a never-ending layer of fluff and fur to keep them warm and happy throughout the night. That being said, once your dog lays in this fluffy igloo, he or she will probably spend their days in it too! Why We Liked It – Upon laying in this fluffy igloo, your dog will only resemble one word: Lazy! 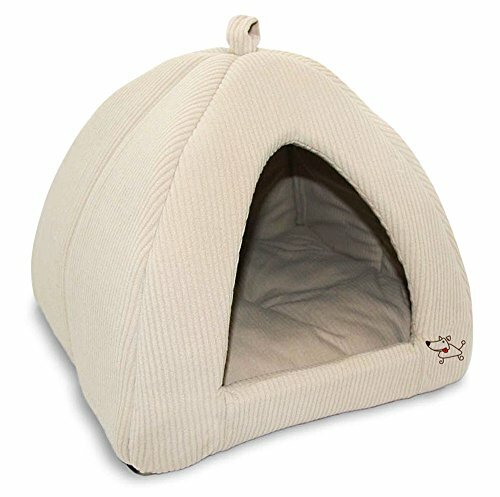 The ultimate lavish comfort of this small dog igloo is unrivaled by almost any other pet product around. This handwoven pet igloo is one of the most unique styles of dog houses around. Honestly we were a bit surprised when we first saw this Deluxe dog house, because it looks like nothing we’ve seen! This pet all weather shelter looks like a princess carriage or a chariot, which is a perfect fit for your adorable pup. Instead of settling for a normal nail and hammer dog house, your dog can live in luxury! Made with faux rattan, this handwoven little dog home is a beautiful fit to your own home. It looks the same as a basket, but it functions as the perfect dog igloo. What’s better? 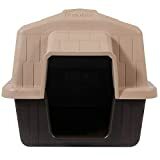 This deluxe dog house has a flat top surface for you to put books, towels, plants, or any other thing you want on top. What other dog house also functions as a side table? It’s unique and in a world of league of its own! The soft sitting cushion is light a cloud pillow for your dog to relax on after a long day at play. Come on, playing fetch and swimming all day is super exhausting! The breathable rattan is porous enough to have superior air flow, which keeps your dog cool and feeling fresh. It’s time to ditch the warm, condensation-filled plastic dog houses. 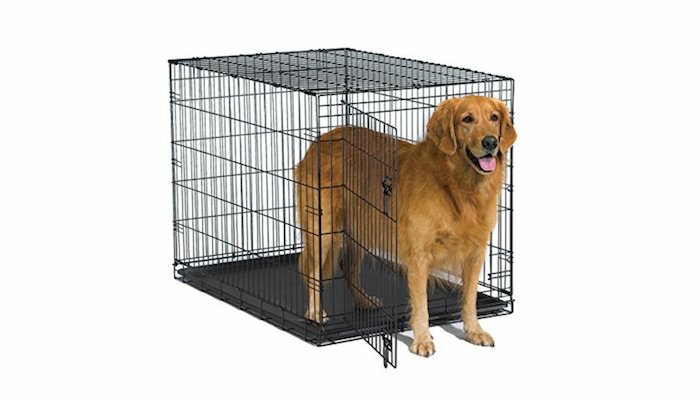 Why We Liked It – This rattan indoor outdoor dog kennel is perfect for breathability and allowing airflow throughout your dog’s house. This will keep them comfortable and prevent them from overheating. As this is for outdoor use as well as indoor, you may wish to take a look at these bark control devices that can help your neighbours out! 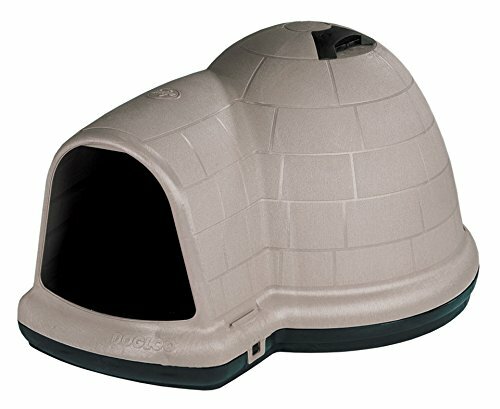 If you’re looking for a small to medium igloo dog house, this Petmate Dogloo II is worth a look. It’s well insulated and the perfect size to keep your dog warm and feeling protected. The size is perfectly compact to give your little dog some room while not taking up too much space in the backyard. Using no chemicals in the creation of this small dog igloo, this company ensures that nothing on this Petmate igloo dog house can harm your dog. Many other competitors use all kinds of chemical washes for molding and cleaning their dog igloo houses before sending them off to sell. The edges of the pet shelter are rounded to prevent and cutting or harmful points that might hurt your dog in one way or another. The bottom is also super soft to keep your pup comfortable. This insulated dog igloo pet shelter is built with some of the strongest grade plastics on the market, which means you don’t have to worry about cracking or wear and tear from the elements. Instead of tossing it in the garbage every other year like some of the cheaper competition, you can use this durable Petmate Dogloo II for several more years to come. Why We Liked It – This Petmate igloo dog house has everything your dog needs and nothing they don’t. The insulated dog house just a perfect little dog home to stay warm and dry (or cool and dry in the summer). Another great fluffy dog igloo is the Best Pet Supplies Tent Dog Bed. It’s a perfect little warm room for your small dog to relax in. You can easily wash it, and it doesn’t ever really lose its shape. You can also use the dog supplies tent bed & igloo as a travel crate for taking your dog on those long road trips. You don’t have to worry about your pup hurting his or her joints while taking sharp turns in the car anymore! This small dog igloo has all kinds of colors and sizes that truly give you a nearly endless supply of options. Instead of settling for whatever’s available, you can select what you think you pup would love the most! Choose from small, medium, large, and extra-large to fit any size dog. You can also pick from many different colors like Grey, Tan, Brown, and Beige. There’s also the choice of dome design, tent, or cave! 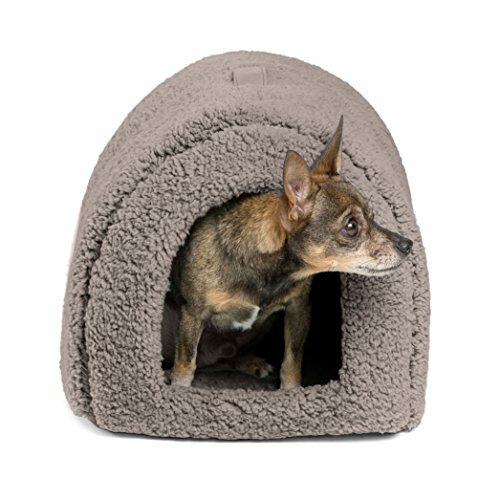 Each of these unique little dog igloos are coated with soft, plush fur for all around comfort. They’re built with a dense yet soft foam to protect your dog’s joint and muscles from the ground. Instead of laying on a hard wood floor of a normal dog house, this one allows your dog to relax to their fullest potential! Why We Liked It – Any dog would love to have a fluffy dog igloo to relax in at the end of the day. Its strong structural foam and soft fur make it so much more worth the investment. Now that you’ve seen all the options that we’ve suggested, you probably still have a few other questions before you make your choice. We don’t blame you either, since there’s still such a large variety. Many factors play into choosing the right igloo doghouse, from size, to material, to location. If you have a large dog, a small little dog igloo crate won’t do. You also have to know if the pet shelter will be inside or outside. Fur dog igloos won’t hold up very well in the rain, but a hard-shelled plastic dog igloo would look tacky indoors. With so many questions still unanswered, we decided to make this section to help secure the right selection for you. If you’re getting an outdoor dog house, you may wish to see our review on the top grass turfs for dogs – protect your lovely lawn! Many outdoor igloo dog houses don’t need insulating since they come pre-insulated. However, you can help further insulate them by adding insulation spray foam or putting them underneath an outdoor overhang. Another great way to insulate an outdoor dog kennel or dog-friendly igloo house is to raise it off the ground slightly. The ground holds temperatures very well, and transfers those temperatures just as easily. Put the dog igloo on top of a mat or a structural foam board to prevent your dog’s house from overheating or getting too cold. Since labs are generally a larger breed, they require a larger dog igloo. Generally speaking, 50+ inches is a great starting point for the length, and 30+ inches is a great starting point for the width. Remember, dog igloos shouldn’t be too large or they won’t hold their warmth as well in the winter months. 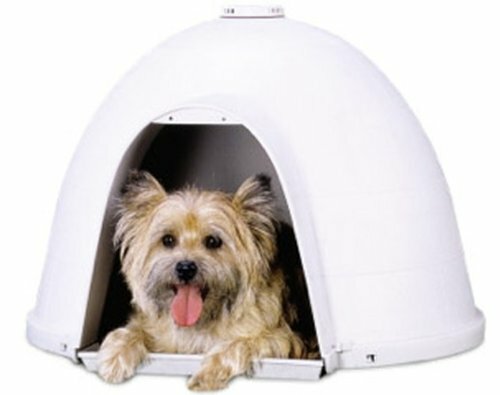 You can buy an igloo dog house from Amazon since they have the cheapest and widest selection of dog igloos. You can get a cheap dog igloo house that would normally be much more expensive at your local pet store. Convenience charges are out the roof in store fronts, which makes the price hike up much more than it would be just buying your products online for the most part. Based on the size of your dog, you can easily choose the size of the igloo dog house you need. Your dog wouldn’t feel comfortable in something way too small or way too big, so make sure you check the dimensions on the product description. Many of the dog igloos with multiple sizes will have a size chart to tell you exactly what you need for your dog. To clean an igloo dog house, you should first remove all cushions, strong dog toys, and mats from within the doghouse. Then you’ll need to spray off all the dust and dirt that’s built up over time. Soap up the pet’s house with a chemical-free (or no harsh chemicals) cleaner that’s animal safe. Finally, spray off the soap and let it sit until it dries, placing the dog toys and cushions back in afterward. If you have a fluffy indoor igloo doghouse, many of them are simply machine-washable, which makes it 100 times easier on you! There’s so many different styles, shapes, colors, builds, and sizes to all the dog houses on the market. Unfortunately, many of them are either not built durably or they’re not comfortable for your dog whatsoever. That being said, dog igloos are a perfect solution, and they provide amazing insulation and a comfortable environment for your pup. However, not all dog igloos are the same. Many of them are built poorly for mass production and profit, without regard for your dog’s safety or comfort. Luckily, we’ve blocked out all of those below top brands and igloos from our list. We did all the research we could to provide you with the top 5 best dog igloos that we could find. Hopefully this made your search a little bit easier, and narrowed down to results enough for you to make that decision! Dog igloo houses require regular cleaning just as human houses do! Spray your dog’s igloo down a couple times a month to get rid of insects and prevent cracking from the elements. Read more about keeping your dog clean, as well as his or her area. 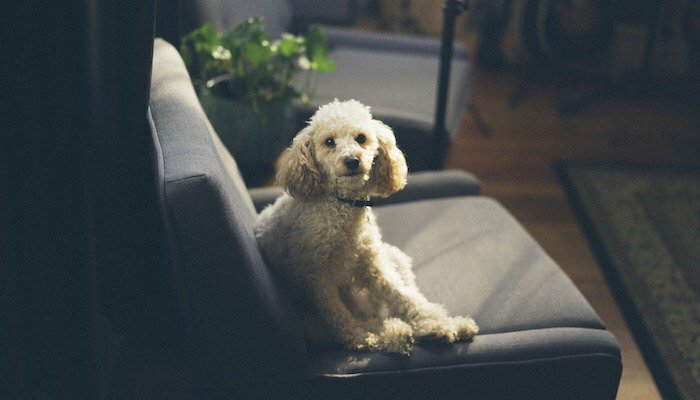 Buying a soft, dense structural foam for the bottom of a pet’s house will protect your dog’s joints and muscles from the shock and impact of the hard surface that it’s sitting on.